Disney’s Grand Floridian Resort and Spa is the flagship resort at Walt Disney World. It’s a bucket list item. It’s the one you talk about as you pass through it on the monorail. It’s the hotel everyone wants to hear about. So how does it measure up to its reputation? Read on to find out! Grand Floridian is generally regarded as the “fanciest” and flagship resort at Walt Disney World, and it is priced accordingly. For 2019, Grand Floridian rooms start at $657 per night (photo below is pre-tax). This compares to $461 at Contemporary and $546 at Polynesian. We booked our Main Building Club Level Theme Park View room through our choice Authorized Disney Vacation Planner, Lauren Quirk of Enchanted Escapes Travel. We paid $767.81 per night on an Annual Passholder offer rate. The rack rate for the room was $1181 per night, which meant our offer rate was about 35% off. Between standard offers and maybe discounted prices at Expedia or Priceline, there may be times when rates get down to between $400 and $500. Alternatively, you can rent Disney Vacation Club points to stay at Grand Floridian Villas (we highly recommend you consider this route). We arrived via Uber from our nearby apartment. Most guests will arrive via Disney’s Magical Express shuttle service from Orlando International Airport. There was no line to check in, and since we were staying Club Level, the Cast Member called down someone from the club. She escorted us up to the Royal Palm Club—the Main Building Club Level at Grand Floridian. If you check in online, or you arrive early, and your room isn’t ready, you can leave your bags with bell services and easily get to Magic Kingdom by monorail. Grand Floridian isn’t as spread out as the moderate resorts, but it is a large resort with plenty of offerings. The main building contains check-in, the (impressive) lobby, the shops, and most of the restaurants. These are spread across the first and second floors. The only hotel rooms in the main building are Club Level rooms and suites, on the third through fifth floors. There are five outer buildings containing the rest of the rooms. There is also a convention center (which we won’t be discussing here), a Disney Vacation Club building (The Villas at Disney’s Grand Floridian Resort and Spa, which we also won’t be discussing) and a fitness center / spa building. There are two pools amongst the buildings and beach space facing Polynesian. Neither pool is particularly impressive. The Courtyard Pool is almost like something out of the value resorts (but with much nicer chairs). The Beach Pool is smaller but has a little more design and fun to it, including a water slide and great views of the Seven Seas Lagoon. There’s also an accompanying water play area. You can walk to Polynesian and Transportation and Ticket Center from Grand Floridian along the Seven Seas Lagoon. And at the north end of the property are the docks and Narcoossee’s Restaurant. The lobby is the highlight of the resort, and like any Disney lobby it’s open to all who wish to check it out. We highly recommend paying a visit to it from Magic Kingdom if you can spare the time. The theming is “Victorian” luxury, and the hotel delivers well on that. Some critics say this theming is getting a bit dated. I don’t really feel that. The resort is filled with these luxurious details, including a good peppering of Disney theming. We’ll discuss the theme, pricing, and “luxury” of the resort in our conclusions section. For now, let’s stick to the hard details and move onto the rooms. The Grand Floridian rooms were last refurbished in 2014/2015, putting them in the same era as the rooms at BoardWalk Inn, which I particularly liked. I was pleasantly impressed with our Grand Floridian Theme Park View room. The furniture looks a little dated, but it’s challenging to get modern furniture to fit a Victorian theme. I was very pleased to seen plentiful outlets and USB ports, including on the bedside table. There’s definitely no beating the Theme Park view. We have a post Comparing Theme Park Views of Magic Kingdom at the Monorail Resorts if you’re set on a special view. Personally, I think they should take the room in a more vibrant direction, akin to what you’ll find at Tokyo Disneyland Hotel or Tokyo DisneySea Hotel MiraCosta. You can get a standard “good” Disney hotel room at any deluxe—why not make Grand Floridian a true experience? But modern, sleek design seems to be winning the day. I mentioned in my BoardWalk Review that I feared those rooms getting refurbished. The situation has to be even more grim for Grand Floridian—how do you possibly keep Victorian theming within the direction the rooms have been going? The big perk of the Grand Floridian location is that you’re a single monorail stop from Magic Kingdom (when going to the Magic Kingdom). This is nice because it makes for short trips, but it also makes for crowded monorails. And like all the monorail resorts, the lines can get quite long around rope drop. As with all the monorail resorts, security is done before you get on the monorail, saving you somewhat from the security lines at Magic Kingdom (you will need to go through security again at Epcot). Coming back from Magic Kingdom, you’re the fourth monorail stop, following Contemporary, Transportation and Ticket Center, and Polynesian. For this reason, it makes more sense to utilize the boat transportation coming from Magic Kingdom back to Grand Floridian. It’s a three-minute boat ride with boats departing roughly every ten minutes. The “Gold Flag” boat goes from Magic Kingdom, to Grand Floridian, to Polynesian, to Magic Kingdom. To visit Epcot, you’ll need to take the monorail to Transportation and Ticket Center and then transfer to the Epcot monorail. This is definitely the most annoying journey you can make from Grand Floridian and can easily take 45 minutes. If you’re in a pinch, we recommend taking an Uber, which will take about 10 minutes and cost about $10. To Hollywood Studios, Animal Kingdom, Disney Springs, Typhoon Lagoon, and Blizzard Beach you’ll rely on bus. Grand Floridian sometimes shares buses with Polynesian, particularly during the middle of the day. We always recommend you also consider using Uber at Walt Disney World. Finally, keep in mind that if you’re flexible, you can always hop on a bus for Polynesian and walk home from there. This won’t always save you time, but particularly in the middle of the day (when bus transport is at its worst), it’s a good option. Grand Floridian has one of the largest sets of restaurants of any Disney hotel, and it arguably has the most impressive restaurant lineup. Keep in mind that you’re also just a monorail ride away from dining at Magic Kingdom, Contemporary, and Polynesian. Grand Floridian has a deluxe resort rarity—a decent quick service option with good hours. How good? 24 hours! That’s right—Gasparilla Grill, located on the first floor of the main building, is a 24-hour quick service option. For late night, they’re limited to pizza, but during the other meals they have full menus. There’s a lot to unpack here. If we’re talking Disney Dining Plan, there are four table service restaurants at Grand Floridian—Grand Floridian Cafe (casual), 1900 Park Fare (character dining), Narcoossee’s (signature, 2X credits), and Citricos (signature, 2X credits). 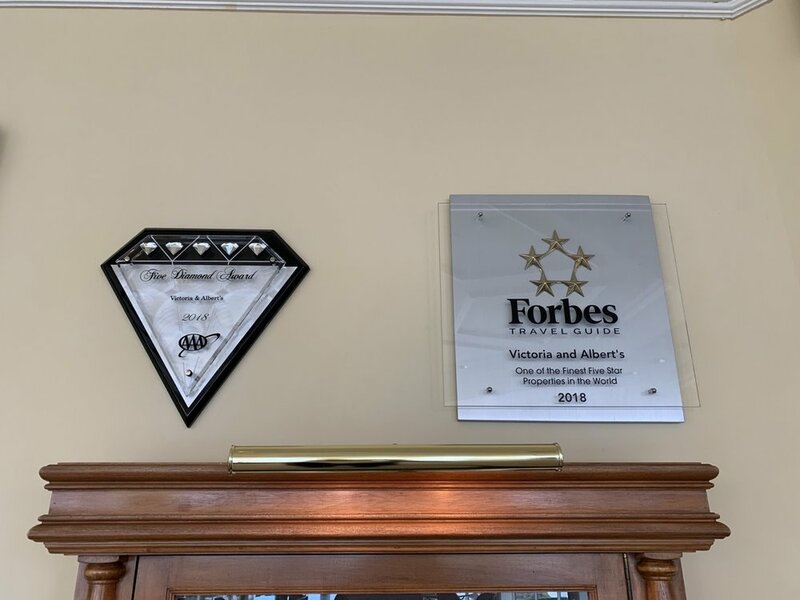 Additionally, there is the legendary Victoria & Albert’s, so super-fancy it isn’t even a signature table service restaurant—you just cannot use the dining plan here. Finally, there is the Garden View Tea Room, which does not participate in the Disney dining plan either. While we have some meals at some of these years ago, for all intents and purposes we might as well assume we’ve never eaten at any of them. We’ll briefly describe the restaurants. For reviews we recommend you check out Disney Tourist Blog, easyWDW, and Disney Food Blog. Grand Floridian Cafe is the casual table service restaurant at Grand Floridian. If you’re looking for a non-pretentious, comfortable breakfast, lunch, or dinner, this is going to be your pick. It’s located in the back of the main building, on the first floor, next to 1900 Park Fare and just past Sandy Cove. 1900 Park Fare offers two character buffet meals. The Supercalifragilistic breakfast features characters such as Mary Poppins, Alice in Wonderland, The Mad Hatter, Tigger, and Winnie the Pooh. The Cinderella dinner typically features Cinderella, Prince Charming, Lady Tremaine, Anastasia, and Drizella. It’s located in the back of the main building, on the first floor, next to Grand Floridian Cafe and just past Sandy Cove. Narcoossee’s is a signature dining restaurant specializing primarily in seafood and requiring two table service credits under the Disney dining plan. It sits in its own separate building on the edge of the Seven Seas Lagoon, making it a popular choice for trying to get a firework view. Citricos is a signature dining restaurant specializing in Mediterranean cuisine and requiring two table service credits under the Disney dining plan. 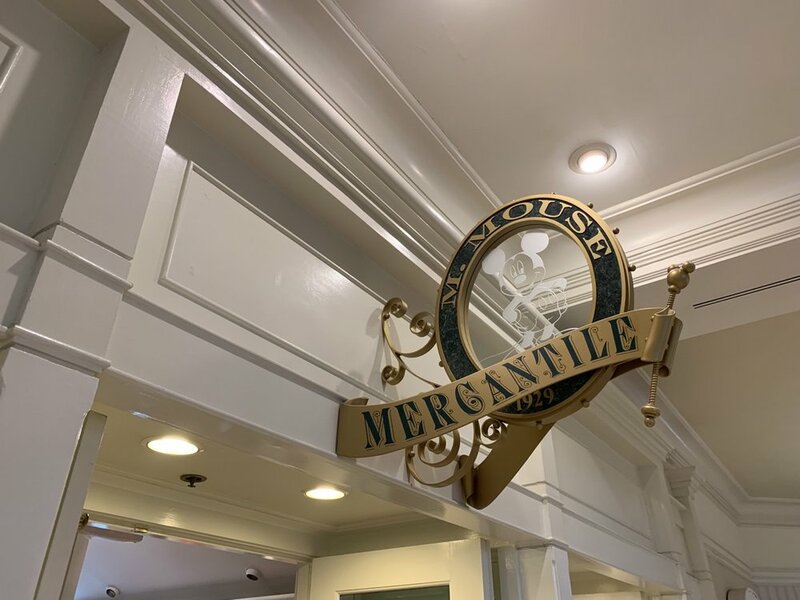 It’s located on the second floor of the main building, in the back next to Victoria and Albert’s (and just above Grand Floridian Cafe). Victoria & Albert’s is widely regarded as the best restaurant at Walt Disney World and one of the best in Florida. As Disney puts it, the restaurant “has won AAA’s illustrious Five Diamond Award, the Forbes Travel Guide Five-Star Award, glowing Zagat reviews and a host of other accolades.” The prix fixed menu starts at around $200. It’s located on the second floor of the main building, in the back next to Citricos (and just above 1900 Park Fare). Garden View Tea Room serves a variety of “afternoon tea” sittings. It is located on the first floor of the main building, adjacent to the lobby. Besides the two pool bars, there is one true lounge at Grand Floridian plus two restaurant bars. Mizner’s Lounge is the main lounge at Grand Floridian. It’s located on the second floor of the main building, adjacent to the lobby. It’s a fine place to grab a drink, but not necessarily one of our favorites. A big perk, though, is the presence of a live band and pianist. Update: As of April 2019 and until an unknown date, Mizner’s is closed for renovation/replacement. This does not really impact our view of the resort, and we recommend walking over to the bars at Polynesian. There are bars at both Citricos and Narcoossee’s. Given how busy those restaurants get, we don’t really see why you’d choose those bars to spend your time at. If Mizner’s isn’t your thing, we recommend walking over to Polynesian, which has some of our favorite bars at Walt Disney World. Like every Disney hotel, Grand Floridian maintains a full activity schedule for guests who want to spend the day away from the park. Besides the standard pool activities, you’ll find sunrise yoga, lawn games, movies under the stars, and nightly campfires. There are also plenty of paid boating experiences on the Seven Seas Lagoon. Inside the main building is a salon, Ivy Trellis Salon, which focuses on hair, nails, and make-up. At the far south end of the resort—the end closest to Polynesian—is a building with the Senses spa and the 24-hour fitness center. Senses offers facials, massages, and other services. Grand Floridian has the most extensive shopping lineup of the Walt Disney World resorts. M. Mouse Mercantile is the spot to go if you’re looking for ears, toys, keychains, simple jewelry, Disney clothing, and some household items. It’s located on the second floor of the main building, just next to the monorail. Sandy Cove Gifts and Sundries is where you’ll find snack food as well as some awesome Grand Floridian gear. It’s located just off the lobby on the first floor of the main building. Basin White is a soap store on the second floor of the main building. Summer Lace is a ladies store offering mostly high-end casual wear, as well as accessories and jewelry. It is located adjacent to the lobby on the first floor of the main building. Commander Porter’s is the men’s counterpart to Summer Lace, offering high-end casual wear and accessories for men. It is located on the second floor of the main building. The truth is…in between? Both? If you sit in the lobby (or Mizner’s or the Club Lounge) during sunset while the band plays, there’s truly something remarkable about the resort. It does entrance you and pull you into its Victorian charm. Grand Floridian is a bucket list item for many Disney travelers. The high price keeps you from just visiting on your annual trip. It has a sense of exclusivity that way, and obviously that plays into it appeal. If you ask my mom the best hotel at Walt Disney World, she’d say the Grand Floridian in an instant. Now, she couldn’t tell the difference between a Best Western and a Ritz-Carlton if you didn’t tell her which was which, but she’s been primed by Disney to know Grand Floridian is the gold standard. The flip-side of this is that Grand Floridian is held back by its price (shocking suggestion, I know). It’s not simply “it’s too pricey for its quality.” I think the problem should at least be put in more specific terms. I think the problem is that it’s priced like a luxury hotel when really it’s “just” a great hotel with a Victorian luxury theme. The thing is, Grand Floridian is the epitome of “Disney luxury.” That is, it isn’t luxury, but it’s good, gimmicky imitation luxury. What isn’t “truly” luxurious about it? Well the price tag invites you to find flaws, and it isn’t hard. There are the 45-minute trips to Epcot because Disney refuses to give you a ten-minute bus ride. There are the shared buses with Polynesian. There’s the fact that you’re competing with every other Disney World vacationer for reservations at the restaurants. The pools are fine, but they’re not anywhere near the best on property. I’d guess many kids would even prefer Art of Animation for a good pool. The rooms are “Disney Victorian,” which, while appealing in a Disney vacation way, are not in keeping with modern luxury standards. And again, they’re far from the best rooms on property. These are all picky imperfections, to be sure. But this is the standard that Disney has priced Grand Floridian to be held to. The problem is that price and exclusivity are key to creating the impression of luxury. It definitely fools some people, and some people are willing to be fooled. Falling in love with Grand Floridian when you know it isn’t genuine luxury is no worse than falling in love with the Italy pavilion even when you know it isn’t genuine Italy. So maybe the price is just a part of the theme, I don’t know. But I’m tempted to say that if you compared this hotel on equal pricing against Animal Kingdom Lodge, Polynesian, and Wilderness Lodge, it actually could hold its ground. But priced at $100 to $300 more than other Disney deluxe resorts, you just have to ask yourself—how much are you willing to be fooled?